There’s a really interesting piece of art down in Wall Street that has captured the people’s attention for some time now. It’s a rat, and a really huge one for that matter. This new phenomenon sits across the street right opposite the Federal Reserve building. 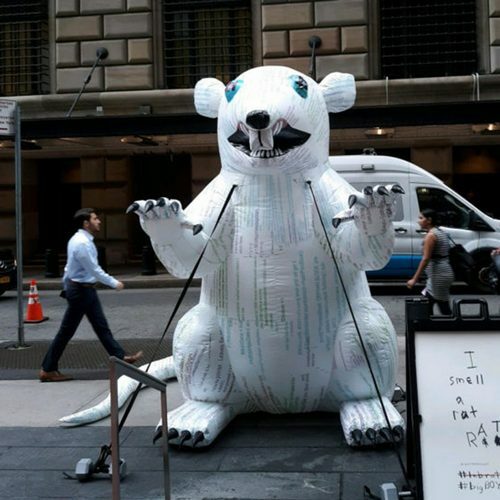 However, it’s not the giant white inflatable rat that’s been stirring up Wall Street, but rather what it actually represents. The man responsible for the huge rat’s existence on America’s most popular street is one Nelson Saiers. Nelson spent the better part of his life as a hedge fund manager in Wall Street until he stopped trading in 2014. Since then, Nelson has dedicated his time to revealing the ills of the traditional financial system that he believes is way too broken to survive in the long run. To better put his point across, this man has opted to use art. In fact, he’s not alone in this line of thinking. There have been numerous cases of people using art to speak to the public about the broken system. Often, they leave spectacular pieces of art or paintings on buildings all across cities. Such art has been spotted in a number of the world’s most popular cities – including France’s Paris. In precise terms, the huge inflatable sewer rat bearing down on the US Federal Reserve building has its body covered with art depicting Bitcoin code, a spectacle that symbolizes Nelson’s perception of a better financial system as opposed to the mainstream centralized system. In his view, a decentralized crypto ecosystem would do much better than the current system that operates under the tight grip of the authorities. Indeed, the last two decades have seen various artists come out to use their talents to depict the apparent financial inequalities in the current system. One of the most prominent artists in this school of thought is Banksy. In Banksy’s opinion, a rat is a symbol of resilience and freedom, saying that rats exist without permission and have zero attachment to conservative societal standards. Back in 2016, Andreas Antonopoulous referred to Bitcoin as the “sewer rat of currencies.” Andreas is computer scientist. He went on to give the imagery of an injured but dynamic and robust financial system represented by the sewer rat. Nicknamed “The Warhol of Wall Street,” Nelson’s ambition doesn’t start or end with the giant white inflatable sewer rat bearing down on the Federal Reserve building. This isn’t his first such project. In fact, he plans to remove the rat once its point is home. With such things happening, Bitcoin seems to be gaining more traction in terms of popularity and credibility as the valid alternative to the restrictive traditional financial system. Could such acts cause a Bitcoin bull run?